Washington (CNN) - Moments after narrowly losing a key vote on the hotly contested Wall Street reform bill Wednesday, Senate Majority Leader Harry Reid told a news conference that another senator "broke his word with me." It was a rare public rebuke of a fellow senator, and while Reid, D-Nevada, and his aides refused to identify the individual or provide specifics about the charge, other Senate aides from both parties said Reid was referring to Scott Brown, the new Republican senator from Massachusetts. An aide to Brown confirmed that the senator had signaled to Reid he would vote for the motion to end debate on the financial regulations bill, but said it was conditioned on changes that had not been made by the time of the Wednesday's procedural vote. "Harry Reid does not speak for Scott Brown. Scott Brown speaks for Scott Brown," Brown spokeswomen Gail Gitcho said in response to Reid's accusation. "Bipartisanship is a two-way street." Gitcho said Brown didn't vote to end the debate "because the way this bill is currently constructed it would cost jobs in Massachusetts and does not include the fixes he understood were in the bill." Brown later also confirmed the switch, saying that he told Reid on Tuesday he would support the motion to end debate on the financial regulations reform bill. "Based on everything that's been happening, as you all have seen, it's been a bipartisan process, a lot of good debate. 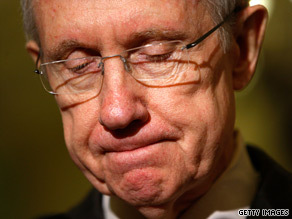 No BS," Brown told reporters in explaining why he initially supported Reid's motion. "But then we were kind of caught off guard with the fact that that we weren't getting the information from the leadership that we wanted. We made phone calls, we didn't get the proper response." A spokesman for Reid, Jim Manley, refused to comment when asked if Brown told Reid his support was conditional on changes to the bill. Brown and Reid were seen on the Republican side of the Senate floor having an intense discussion for several minutes after Brown cast his vote. The discussion ended with Brown disappearing into the Republican cloakroom. The public dispute between Reid and Brown is unusual because Brown is a moderate Republican who already has crossed party lines on several occasions to give important wins to Democrats, and could do so again in the future. One GOP source, who asked not to be identified, warned that Reid "can't haul off and call the one Republican you can rely on a liar." Brown seemed unfazed by Reid's accusation. "I never take any of this personally," Brown said. "I know that he's under a lot of pressure." The motion to end debate needed 60 votes to pass, and it failed by a count of 57-42. Reid's Democratic caucus has 59 seats, meaning it needed one Republican vote to move forward on the bill. However, it was unclear if the motion would have passed even with Brown's support. The final tally included a 'no' vote by Reid that he cast to ensure he could propose the motion again, as well as "no" votes by two other Democrats, while two Republicans voted "yes." One Democratic senator missed the vote. The two Democrats who opposed ending debate, Sen. Maria Cantwell of Washington and Sen. Russ Feingold of Wisconsin, both said they wanted the bill's regulation of financial markets and trading to be strengthened. Who is accusing who?! The old crook is up for something I guess, hurry get rid of Harry Read! Wow, if he's gonna be po'd at anyone, seems it should be the two members of his own party who voted no. Brown is already an embarrassment to Massachusettes. To go from the most respected Senator in recent memory, Ted Kennedy, to this buffoon Brown must make Bay State voters cringe. Reid never broke his word? The biggest crook in Washington whinning! Bipartisanship is a two way street. What a great line. it probably went right over senator Reid's head. It's pretty obvious who is on the banks side. Senator Brown should enjoy his 15 minutes of fame because their is no way he can get re elected in Mass. . That was /is a Kennedy seat and Brown can get back to driving his pickup.due to past performances he may qualify for a position in the GOP C street group after losing hisSEAT. Piss and moan, Harry, piss and moan. You'll be out soon then you won't have to worry about it any more. Harry Reid does not do bipartisan well at all. It's more difficult, isn't it? You actually have to propose legislation that makes sense instead of just supporting the Democratic special interest groups. Have I thanked Massachusetts voters lately? Every day, every day. Scott Brown didn't vote on the Wall Street reform bill because his Wall Street masters told him not to. The Party of No strikes again. I say in NOvember, vote No on the Party of No. And you Harry Reid have broken your promise to your constituents when your took your oath of office to uphold the laws of the United States of America. You have broken your campaign promises when you stated that you would listen to those that voted for you, You think that you know what is best for your constituents even when they tell you that they don't want your proposed bills to become law. No Mr. Reid, I believe that it is you who has broken his promises. Mr. Pot, let me introduce you to Mr. Kettle. The Republicans are to tied into the big banks and wall street to want reform. That would cut out millions of there campaign money. I don't know who speaks for Scott Brown, but it should be Harry Reid, because the man (Scott) obviously can't think, or speak for himself. He is the product of Republican R&D late night sessions without a soul of his own! Who cares what Reid tinks. He is not going to be back next year anyway. REID get real you signed up with the wrong team. And you s c r e w e d the wrong elderly people. Please Senator Brown is a Republican but what did you expect he was going to do. ...soooo...what can't Brown do for you....? what did he expect he's a republican! Scott Brown is worse than what we all expected: we are going to have another few months of this garbage generator. Reid is a liar? Taking cues from Blumenthal I see. It goes to show that any Republican or thier word cannot be trusted, they are simply "Snakes in the Grass"
someone else of breaking their word. Follows palin (fact-check found her to be the biggest liar yet).